Budds' Chev | Blog | LED lighting: useful feature—or fashion statement? LED lighting: useful feature—or fashion statement? The 2000 Cadillac Deville was quite a trendsetter. No, it wasn’t the smooth V8, the creamy ride or the relaxing leather seats that broke new ground. It was the LED tail lights. Now, nearly 20 years later, LED tail lights are common on many vehicles (especially higher-end models). You’ll also see LED daylight running lights, LED turn signals and even LED headlights. But just because everyone’s doing it, does that mean they offer any real benefit? Or is this just a phase our cars are going through? To answer this we’ll need to explain what makes LED lighting different. Then we can cover the benefits. Finally, we’ll look at some GM vehicles that use LEDs. Thomas Edison perfected the incandescent light bulb. The design he invented works by sending electricity through a thin wire filament. Resistance makes it glow white hot. And yes, this is the primary way we’ve made light for over a century. But now the incandescent light bulb is being superseded in cars by light-emitting diodes—better known as LEDs. LEDs are pieces of silicon, modified to give off light when an electric current is applied. So what about white LEDs? Actually, there’s no such thing. The white light is achieved by a special coating on the inside of the LED housing. Now you know what makes LEDs superior to old-fashioned lightbulbs you’ll appreciate why Cadillac decided to use them for the brake lights in the Deville. No more getting pulled over for having a bulb out! Okay, that’s the one we can all appreciate, but there are two more benefits. A second benefit is that they save energy. Now, sure—you don’t drive around with your brake lights on all the time, but your daylight running lights are always on. Replace those with white LEDs and you lower the electrical power drawn. That means the alternator works a little less, and you save a tiny bit of gas. Add those savings up over time and they can become significant. There’s another reason car makers are eager to implement LED lighting: their stylists love it. LEDs free them from the constraints of globe-shaped lightbulbs. That’s why you’re now seeing cars with terrific variety in how the lights are designed. Cadillac exemplifies this new freedom. Take a look at the simply beautiful “blades” of light they’ve engineered into the front of their current models. 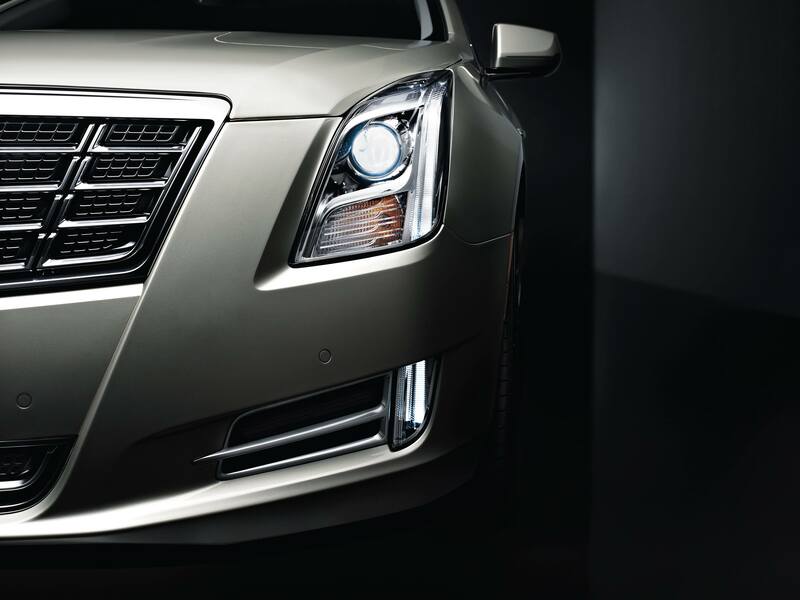 No other car has anything like it, and it ensures a Cadillac is instantly recognizable, even in the dark. Headlights have to give out a really intense light. It’s taken a while to develop LEDs with enough power to handle this role, but they are being installed in a few models. And if you’ve been fortunate enough to drive a car with LED headlights you’ll know they do a better job of lighting up the road ahead. What’s more, designers love how they open up a host of amazing new looks. GM cars where LED headlights are available are the Cadillac CT6 sedan and Escalade, plus the Buick Enclave Avenir. And if you’ll settle for “just” LED daytime running lights and tail lights… Well, quite a few models are equipped with those. Chances are, you’re already using LED lights in your home to save energy. Used in your car, they contribute to energy saving there too, but they have other benefits. You’re less likely to have a bulb go out, they may help you avoid being rear-ended, and they help car designers create cars that look cooler than ever before. And if you think LED headlights sound exciting, think about this: engineers are working on laser-powered headlights that will shine even brighter! Sadly they won’t be available for a few years yet, but we’re car fans, right? If there’s one thing car fans have… It’s patience. In any case, if you’d like to see the best in LED lighting—in a car, that is—come down to Budds’ Chevrolet Cadillac Buick GMC and see them for yourself.